Movie maker (Windows 7) is recording in HD and eating up my Hard drive storage. How do I change the setting to normal, or 640x480? in there you can change the resolution and size. I don't see a "file" button on my Windows Movie Maker. give me a few minutes i will have to pull it up on my other computer. and I just noticed today that I've been using about 10 gb for 60 minutes of recording, since I just got a new windows 7 pc. So you're saying the HD signal is a function of a setting on the Sony camcorder, not anything on the Windows MM? So maybe when I was setting up the new windows 7 PC, I may have inadvertantly pressed something on the camcorder to set it for the HD format in recording? So I need to look at the camera then for an HD setting? Any idea where that may be.? I'm at home now, having a 9PM diner..and the PC in question is at the office. So I guess I'll have to be in front of the program when I'm back at the office on Thurs. Ok to continue with you then, as I'm still unclear about what you're referring to? well what type of file is using the space ? if it is a project file than you are saving it as a project. there is no adjustment to that. however you can instead of saving as a project save as a movie. You have control over the resolution and size of a movie. See the picture. on the right side of the tool bar is a button to save as movie. I didn't have a chance to work on the problem yesterday as planned. So I'll get back to it next week. I did check the Sony, and I couldn't find an HD setting that may have gotten turned on by accident. The camera is close to 10-12 years old, and I don't think HD was even available yet. 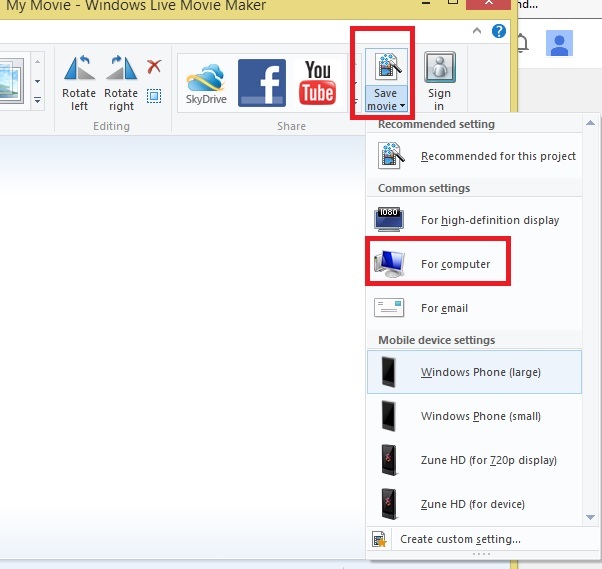 So it seems to be a setting with the "Windows Movie Maker" that is capturing the video from the camera and recording/formatting it in HD, and that is why so much memeory is being taken up by the recordings. Maybe you can research it more? The movie you can adjust the resolution. I didn't see the option of "save as project" or "save as movie". Once the recording is done, I hit finished and then its done. Are you saying at that point its saved as a project, and then I have to open the project and re-save/reformat it at a lower resolution as a movie? The previous WMM didn't have that HD initial recording format. Is there a simpler video recording program I can use that doesn't require having to re-format once recorded? Let me see what you're referring to when I'm back in the office next week. That's where the Sony/Win7PC in question are. Enjoy the fireworks tonight...unless its raining. And have a good Shabbos...! lol will do talk to you when you get to your computer. Are all you clients as difficult? They are all different and believe me many are much worse than you. I dont have any problem with you at all. when you can get in front of the computer we can look at it. If necessary i can log in and see exactly what you are doing and how to do it differently because it should definitely be possible. Just maybe not the way you are using it. I am off for the night just stopped to look so have a good Shabbos and a great weekend and we can sort it out then. Finall we're in high 90's with clods/humidity and summer monsoons begining. Then I'm off to Shul (not). 1st 13 yrs in Lowell, Mass. Than H.S. Englewood N.J, BA/MS Rutgers. 4 yrs in Portland Ore for Naturopathic Medical School. Funny I thought you were still in NY. So you moved from rough winters to brutully rough..? At least you're out of the east coast mayhem..? I can relate the "too cold vs. too warm." Coming from the east than 2 years in Taos NM, and than the NW, and than moving to Tucson was a bit of a shock and took a few summers to get used to. Though the winters being so mild, we've become soft and probably it would be hard moving back to the cold/snow. Even my wife who grew up in Chicago area has adapted. Some people can adapt to this dry climate, others find it really difficult. I liked the dry. Didnt like when it hit 126 one day. i dont care how dry it is. That is still too hot. Couldnt touch anything metal without getting burned. Fortunately Tucson is usally 8-10 degrees cooler than Phoenix. Our ave. high in the summer is around 100-105.
yes 100 isnt bad in the dry. i actually kind of liked it down there. But i like a lot of places. I like new things. you can virtually live anywhere you've a signal. or many per day, its ok. I keep getting "Rate my service"
Does the program send that out, or do you.? I figuered it was program generated so you could get paid? I was waiting to see how my issue gets resolved, is that ok.
You're a nice techie, that's for sure, so I'd rate you high anyways. But if its important to you I can so it sooner that later. The site sends out the reminders i have no control over them and i couldnt stop them if i tried. I never heard back from you from earlier this week. I figued out how to save the project in the movie format at a lower resolution, with your advice. Though it took 45min to convert the 1 hr original. So now I have to go back and convert a slew of projects, to free up my hard drive. The previous version of Windows Movie Maker captured in the regular/Non-HD format. Do you know of another easy to use video capture program that can do the same, so going forward, I don't have to convert each video from HD, the way its now being captured, to regular format, after each session? sorry, I was waiting for you to post in again. Which is the least memory usage? There is a free download, why buy it than. probably it lets you test it than you have to buy it at some point. I honestly dont know which would use the least space. Its probably going to be a choice of quality vs size. there are other issues between them such as whether you can require a codex to copy right it or play it on a phone etc. mpeg or mpeg4 will take less space than avi but will not have as high a quality. I would try doing a 10 minute clip in each of the formats and see which one seems to work for you. I guess that's why you're paid the big bucks..? Or signed a nondisclosure with them? I have other clients i got on my own, but i am not allowed to work with the ones from here outside of this forum. For how long after you helping me does that apply? Its still asking me to rate your service. Maybe it didn't take hold.? I guess once You've been rated the conversation is considered ended. Than I have to pay for another question. So If I don't rate you we can keep having a dialogue? I just hought you'd like to kibbutz. so now you get your few schekles for all the Tzuros I gave you.